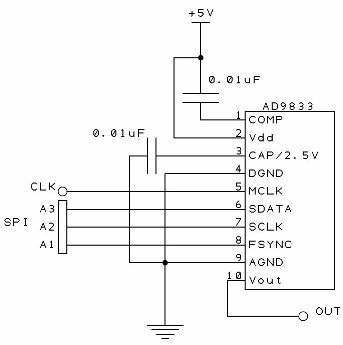 I am attemping to program an AD9833 using a PIC18F2525 and its SPI Interface. I can succefully get a Nice & Clean Square wave out of VOUT at different Frequencies, but the moment I change the Control Word to select ether a Sin or Triangle selection, VOUT goes to 0 Volts flat line. I do not think its a SPI communication problem because anything to do with square wave works perfectly. Made sure with a scope that that correct data from SDATA is indeed being applied on each Falling Edge of SCLK; which is the case. At first I Thought it was my Control Word Settings that were incorrect but after using the same Data given from the AD9833 Device Configuration Assistant(http://designtools.analog.com/dt/ad98334/ad9833.html) the same results are atteined EG. Anything to do with Square Wave works fine, but Sin & Triangle nothing at VOUT. Essentialy in this Example I should only have to change the Control Word in SPI_Packet & SPI_Packet respectivly to (0x2100) &(0x2000) for Sin Wave and (0x2102) & (0x2002) for Triangle, correct? (According to AD9833 Device Configuration Assistant and Data Sheet) But this is not the case. Has anyone had a problem such as this? Any help is appricated, this is the only thing stopping me from sending my project from Alpha to the Beta Stage. I have concluded that the AD9833 I had been using was ether faulty or Damaged and would not produce a SIN or TRIANGLE Waveform. By replacing the Chip with a second AD9833, it worked right off the bat with no change to the code I had been using. Thanks you LiamR for your help and clarifications of my questions.